When you feel the winter is coming and the days are way too long and dark, it’s completely a good idea to visit a warmer place. And obviously North Africa is seems like a good choice and it is however not all the way you think it first. So if you are looking for something hot for January probably you will go further south on the continent, but if you are happy around 20 degrees then Morocco is strongly recommended. 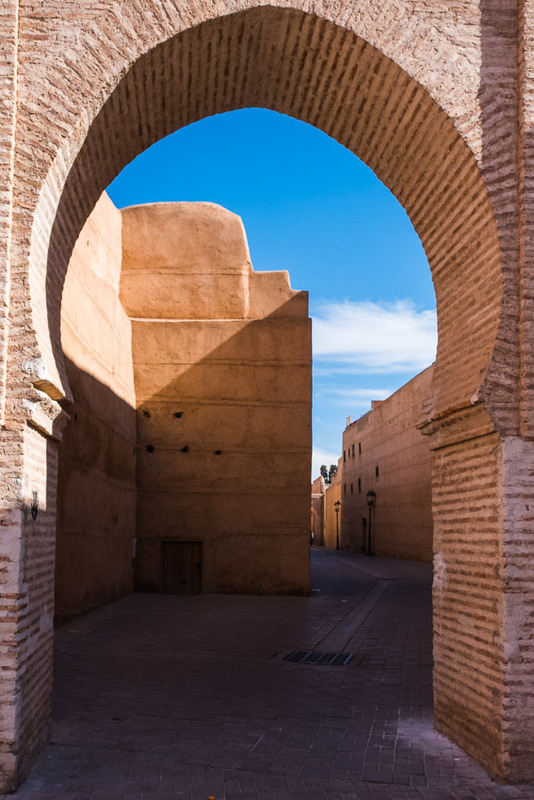 I personally chosen Marrakech as my base point to explore the area, previously heard so many different opinion about this city so I wanted to experience by myself. As soon as I booked my flight I hit up the Airbnb to find a central location to stay. If you want to feel the old vibe of the city try to find something in the Medina area like I did. The Riad was nice and clean and had a rooftop with a beautiful sunset view. It was definitely met with my expectations and I haven’t planned to stay in all long so welcomed the the king sized double bed and the double blanket. Next morning I realised the living room is literally open air, first I find it strange, later my host confirmed its planned like this and the rain just can flow in one way so it’s fine. Later I also find out I’m living next to the Royal palace, from the posting guards it’s always felt like in London however it definitely felt less organised. When you know your boss is not watching kinda situation and the different uniforms was also confusing a bit. Off course if you would like to stay in a hotel you will have plenty of option for this too. It might be a better option for the summer as air condition could be refreshing. The best advice you can get to not ask for it. Narrow streets in Marrakesh, Morocco. It’s a good advice for the first few days that if you think something is around 5 minutes form you that’s probably will take up 15. First you will find it hard to cross on the street safely, I tried to find some logic in it but realised that I just need to be brave enough to step off and cross as quickly as possible. It’s not an easy quest as feels like you are part of some kind of river of mopeds carrying as much people as possible. It’s also hard to avoid invitation to buy literally anything from the street. This is just getting more intense when you are lost in the souks, which you have been told just only open that day. In few days you really wish this would be true, however the fact is in Marrakech hard to not find an open souk any day of the calendar. These are mostly located in the narrow streets around the Jemaa el-Fnaa square functioning as the central of the city. First it can be overwhelming but it’s strongly recommended to get a bit lost around the market and don’t worry in the end you will always find your way back to the middle. The Bahia Palace is a palace and a set of gardens located in Marrakesh, Morocco. It was built in the late 19th century. What you can buy and how much does it cost? As literally you can buy everything in the endless souks, I will try to pick some. So let’s start with the bigger things. Carpets, I haven’t seen a flying one, but it was so many hanging around in multiple colours so who knows. Maybe they were just lazy? Lamps and lanterns. I’m not going to use the same joke again, but those are definitely looks magical and also fragile so be careful with them on the plane. You can buy different spices everywhere and of course the famous mint tea and the leather. I will explore this topic further down. Different baskets and bag besides the traditional dresses are also can be found anywhere. Prices? Those are not going to hang around, you will have to agreed on them. If you find it too much just simple walk away and more likely they will offer you third of the original price, if not you will come across with almost the same things in a minute. Exploring the souks are tiring, but you can always find fresh orange juice for refreshment and the food options are also vary. If you are looking for a good plant based option, the Earth Cafe has a delicious menu. Just have a look on the wall. On the Jemaa el-Fnaa you can also find different attractions and I would like to ask you to avoid them. You can see monkeys and snakes on the square as tourist attraction. For the price of course tourist can take them photos. Please do not support these kind of unethical animal attractions. Of course feel free to have a henna with local motives or a photo in a traditional outfit. You will see tanneries whatever you want or not. Berber Leather products are tanned in either Marrakech or Fes in a natural process that is centuries old. I’m recently avoiding to buy any leather products, however I thought I need to see this and as I did it just confirmed my decision. Also I heard a lot about the scam around these places, so it was something that needed confirmation. I checked the direction on the map just to make sure I know where I’m going. The tanneries located on the outskirt of the city, probably cause of the smell that you cannot miss from a miles. So I headed to the direction to the photography museum when the first guide approached me offering me direction. I thought this is it. He was straight away mentioned he know the best tanneries around, and I’m so lucky these are just open today. These are those sentences we are looking for. I was asking about how much this cost for me and he confirmed its free. I was sure this part not going to be true, but as we haven’t agreed in a price I thought that those coins in my pocket will help me out. When I arrived I got some mint to mask the smell of the pits and I was showed around by a tanner who was just jumped out of it. Leather Tanning process at the Marrakech Tanneries. The tanners only use 100% natural resources and no artificial products or chemicals and they are more than happy to take through on the process that is hardly changed since the medieval times. Obviously there is a fee in the end that must be paid for the insights. The first step is to break down the leather and remove any fat and hair have remained on them, this is being achieved with a mixture of pigeon poo and tannery waste called Iferd. After 2-3 days in the second step they are using the bark from mimosas, oaks and tamaris. These are acting as a natural softening agent when the tanners are using bare feat to squeezed them. As a next stop the leather placed in dyeing pits containing natural vegetable dyes, such as poppy flower (red), indigo (blue), henna (orange), cedar wood (brown), mint (green), and saffron (yellow). As a finishing step it is taken out to dry under the sun on the rooftops surrounding the tannery. Just to confirm we can say that some kind of tanneries scam still exist, but the truth is not as horror that you can find for firs search result. Yes, you have to pay for it, and yes its sounds a lot first, but my advice to don’t afraid to set your own price for the experience. The tanner may looked disappointed, but on the way back I was catching up with my guide who asked me the price I paid. His smile confirmed I did a good bargain. When I was about half way of this post I decided it would be better to separate as its so much to explore. You could spend here 3 days or 5 or a week. So keep tuned as Morocco Part 2 is coming soon with the Atlas Mountains and Ait–Ben-Haddou.